LONGi, founded in 2000, then at that time only making silicon ingots. Other panel makers used these to make their own panels, and were so good, the business took off. They grew fast, and now in fact make their own Longi Panels like the LR6-60PB 300 watt that we offer. They make every item for their panels in house. LONGi has a grown fast, more so than any other maker in the world. Which you'll find out why also in our Longi Solar Panels Review. Also one thing not said yet is that they only make mono panels too. The LONGi 300 watt mono PERC is the specific panel we have experience with, so we will focus on it. This panel has "PERC", which is in fact, just a fancy name for Passivated Emitter Rear Contact. So far we can report that this panel has met expectations, it’s a ‘game changer’ too. It's the first great, “standard size” mono 300 watt panel also at a price like similar poly panels. So what is PERC? For most people, it’s hard to imagine what it's all about, but we’ll try anyway. What PERC does then is improve a panel’s ability to trap more light near the back surface, extracting more power. PERC was first developed in fact by the University of New South Wales in 1983. So there is something to crow about! Their approach also proved to be the best way to get high efficiency. As a result, the UNSW employed it to achieve multiple world records close to 25%. The LONGi 300 mono PERC comes straight off the pallet very much so, looking the goods. A good, strong 40mm black frame also holding it all together. However, you would expect a top Tier 1 panel to be like this. The panels have a ten year product and also a twenty five year performance warranty. 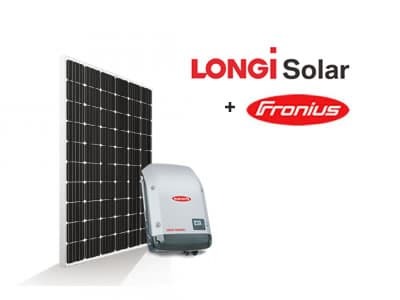 Powerark, one of the larger solar vendors, will also handle warranty for Longi in the short term. Given the growth of this company, we fully expect them to establish a presence here soon. Such a great panel that also covers all the bases for the price. It taunts the LG and Sunpower “super panels” also in performance. So, its mostly warranty and price being the main difference to most buyers. Given what we've seen so far, we're not expecting many if any warranty claims.